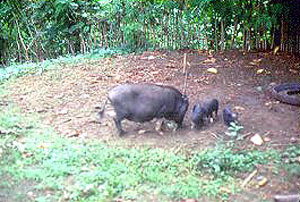 The Philippine Native pig is either black or black with a white belly. Varieties include Ilocos and Jalajala. The Berkjala, Diani, Kaman, Koronadel and Libtong breeds were all developed from this breed. It is now thought to be extinct. The breed is very prolific, in average the gilts could exhibit signs of sexual maturity as young as 4 to 5 months. They are have a low feed conversion ratio. Growing swine reach 60 kilos during the 6 to 8 months fattening period. This breed is popular throughout the Philippines in the for Letchon (broiled whole pig).